In areas adjacent to the Delta-Mendota Canal (DMC), extensive groundwater withdrawal has caused areas of the ground to sink as much as 10 feet, a process known as land subsidence. In an effort to understand and manage land subsidence in the area, the USGS has put in place a land subsidence monitoring network. 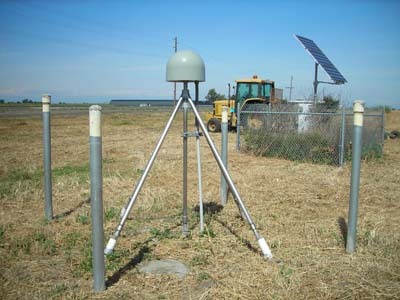 The land subsidence monitoring network is made up of a suite of tools and techniques that capture integrated measurements of land subsidence in the DMC and the Central Valley, including: Interferometric Synthetic Aperture Radar (InSAR); Continuous Global Positioning System (CGPS) Stations; Extensometers; and Piezometers. For the DMC study, scientists use persistent scatterer InSAR to better understand land surface movement. This technique requires 20 or more satellite images taken at different times. The images are then processed to reveal relative ground-elevation change over the time the images were taken. The processed images are displayed as maps, called interferograms, that scientists interpret to see land elevation change along the DMC. The InSAR data is then combined with available historical spirit leveling, extensometer, and GPS data to produce information that describes land subsidence and aquifer-system compaction over a period of time. 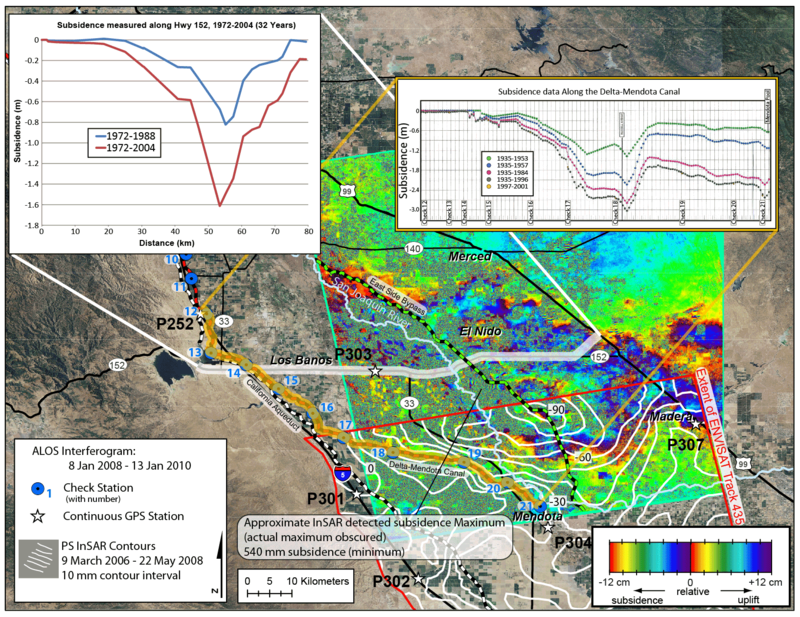 ALOS interferogram showing large subsidence feature affecting Checks 15-21, January 2008-January 2010, San Joaquin Valley, California. Graphs showing subsidence computed from repeat leveling surveys along Highway 152 for 1972-2004 and along the Delta-Mendota Canal for 1935-1996, subsidence computed from GPS surveys at selected check stations for 1997-2001, and contours showing subsidence measured using PS InSAR during March 9, 2006-May 22, 2008, San Joaquin Valley, California. The above is preliminary data and is subject to revision. The interpreted persistent scatterer InSAR data will be used to create maps of changes in land-surface elevations along the DMC. The InSAR data will be combined with available historical leveling, extensometer, and GPS data to produce a time series of land subsidence and aquifer-system compaction. A CGPS station continuously measures the three-dimensional (3D) position of a point on, or more specifically, near the earth's surface. For this study, scientists are primarily interested in vertical movement (subsidence and uplift), but horizontal movement can be obtained with CGPS and can also be informative for subsidence studies. Graphs showing water levels in well 13S/15E-31J6, screened below the Corcoran Clay, and land subsidence at continuous GPS site P304 near Mendota, California, 2004-10. GPS stations generally collect point position information every 15 seconds. To make this data useful for analysis, they are processed to produce a daily point position, which is then concatenated to track the 3D position over time (months and years)(for example, P303). 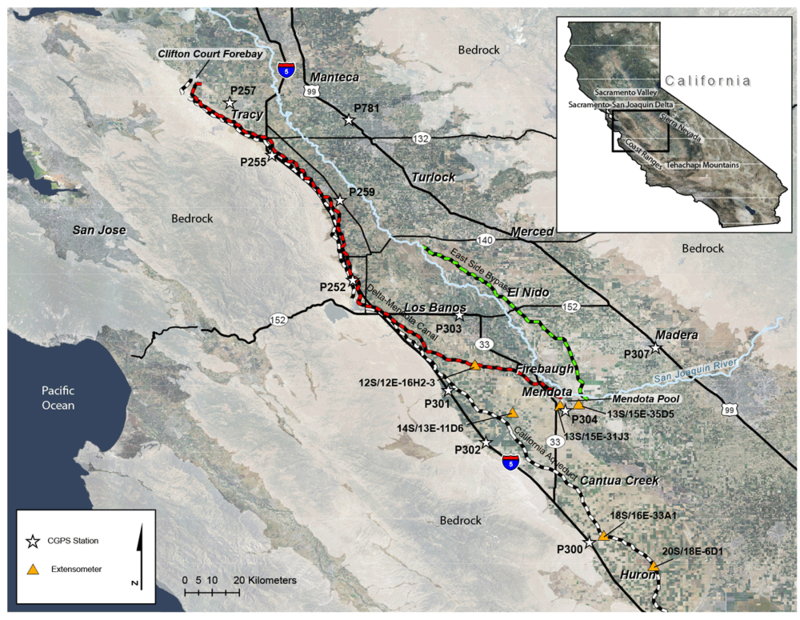 Map showing the location and geographic features of San Joaquin Valley, and locations of continuous GPS and extensometers. Click image to enlarge. An extensometer measures the compaction and expansion of the aquifer system to a specified depth. A number of extensometers were constructed in the 1950s, 1960s, and 1970s near the DMC and California Aqueduct, but some had fallen into disrepair. For this study, four were refurbished in 2012. USGS personnel have visited these sites to download data, to make manual dial gauge and water-level measurements for quality control, and to adjust equipment. A piezometer is a specialized well used to measure water levels at specific depths. When extensometer or CGPS data are paired with groundwater level data from a nearby well, some storage properties of the affected aquifer system can be calculated. During winter and spring of 2010, The USGS constructed 3 piezometers near CGPS station P259 and 3 piezometers near CGPS station Althea. All of these piezometers were instrumented with submersible pressure transducers to measure hourly groundwater levels. Additionally, 2 wells near CGPS station P304 were instrumented to measure hourly groundwater levels. The continuous GPS data and water-level data is used for stress-strain analysis. If water levels fluctuate in the elastic range of stress, the elastic skeletal storage coefficient will be computed. The elastic skeletal storage coefficient is a standard measure of aquifer storage owing to the compressibility of the aquifer-system skeleton and largely governs the recoverable (reversible) deformation of the aquifer system. If water levels continue to decline beyond historically low levels (the inelastic range of stress), it may be possible to compute the inelastic storage coefficient that governs the permanent compaction of the aquifer system. If water levels are fluctuating in both ranges of stress (fluctuating seasonally and declining annually), both the elastic and inelastic storage coefficients could be estimated. Sneed, M., Brandt, J., Solt, M., 2013,Land Subsidence along the Delta-Mendota Canal in the Northern Part of the San Joaquin Valley, California, 2003-10: U.S. Geological Survey Scientific Investigations Report 2013-5142, 87 p.
Faunt, Claudia C. (editor), 2009,Groundwater Availability of the Central Valley Aquifer, California: U.S. Geological Survey Professional Paper 1766, 227 p.